In 1929, as we’ve seen, some rich folks were able to worry what exotic color porcelain they should select when they custom designed their bathrooms. In 1930 well over a third of American houses didn’t even have a flush toilet, according to some estimates. 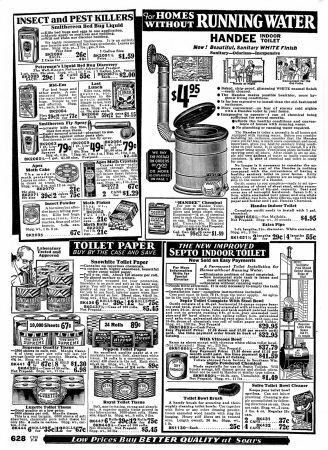 America was still such a rural nation, and so gripped now by “Grapes of Wrath” -level poverty, that Sears in their 1932 catalog featured this page with chemical toilets suitable for the bathroom or outhouse (which they also sold, in their home-plans catalogs). Even though promoted as “Handy at Night”, “No Discomfort in Winter”, and “Convenient for the Old Folks” , the $5 HANDEE model just doesn’t seem very appealing. Especially when placed on the page next to Smithereen bed bug liquid, Last Lunch rodent killer, and several kinds of moth insecticides. But that was the era. 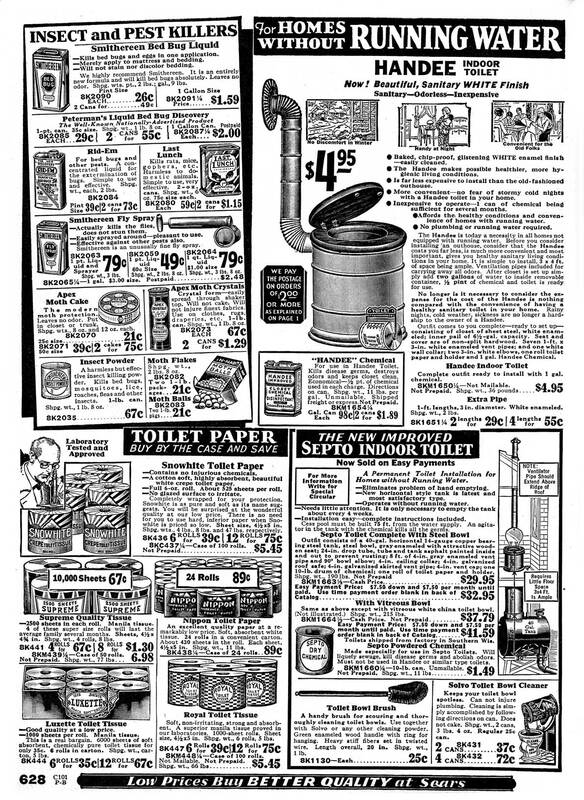 At least Sears was also pushing toilet paper rolls , which still weren’t ubiquitous either. At least these contained no injurious chemicals, and no glazed surface to irritate – gosh, I should hope not. These were certainly better options than wiping with that other often-used source of paper found in early-20th outhouses – Sears catalogs.